Dreamweaver Appointment Calendar is an extension for Adobe Dreamweaver which allows you to book, show and edit appointments as well as create event calendars which show different activities throughout the day. For each day in the calendar you will be able to define which are the timeframes for appointments or activities, add information in the hours already booked or leave them free to allow a reservation later. Note*: This product is for servers with PHP scripts support. 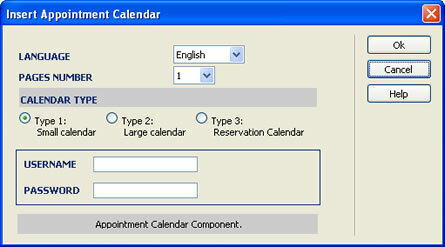 We have the same product for servers with ASP support here: ASP Appointment Calendar. Note**: If you would like to be able to add HTML formatting to your appointment entries, such as colors, backgrounds, etc, check out Appointment Calendar with HTML Editor. Note***: We have a similar product named "Daily Scheduler Calendar" that allows to select time intervals for the appointment among other additional features and configuration options. Note****: This product uses plain text files to store the information. If you are looking for a product based on MySQL databases then check the Appointment Calendar with MySQL Databases. Additional Info: Appointment Calendar - Online FAQ. At this time you will have access to a new option in your Dreamweaver, which can be found under "Dreamweaver Menu >> Commands >> Insert Appointment Calendar"
Set writing permissions to the folder "TDE_AppCalendar/admin/database" where the data will be saved to. You can consult our FAQ if you are not sure how to proceed. Keep in mind that you have to set writing permission for the folder "TDE_AppCalendar/admin/database" and to the files inside it. To know more details about how to set writing permission please read this entry in our FAQ.